This country has 6 colors in their national flag which are Celestial Blue (#4997D0), White (#FFFFFF), Sap Green (#448127), Medium Champagne (#F9F0AA), Liver (Organ) (#6C301E) and Philippine Silver (#B2B6BA). 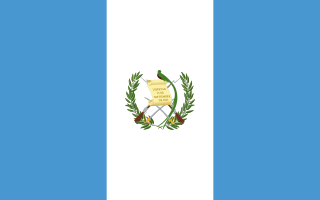 In addition to the two prominent colors – blue and white – the Guetemala flag also has light yellow (champagne), brown, silver (gray) and green. These are present in the country’s coat of arms placed in the center of the flag.